There are no limitations on what a student can do at Idyllwild Arts Academy. 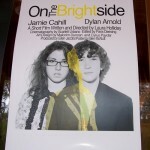 Just a few short weeks ago, film student Laura H. wrote and directed her first short film, “On The Bright Side,” about an eternally optimistic guy who refuses to let his girlfriend break up with him. Laura was also the female lead in “Shortcomings,” a teen angst film created by another film student about a guy with a short whatchamacallit. They were among five films screened at the end of 2010 by the Moving Pictures Department. The IAA Trailers 2010 are now out on You Tube. Not only was Laura a screenwriter, actor, and director this year, but she also composed and sang, “Time Bomb,” one of the songs for her film, “On the Bright Side.” Now, just one week into the summer break, the single is out on iTunes. Along with a guitar and excellent whistler, Laura sings her first single. You can get a short preview of “Time Bomb,” for free, or purchase it for only .99 cents. The cover of her “Time Bomb” single shows a bird’s eye view of life-sized black dominoes on a white board. In between two of the dominoes is a person, but it doesn’t look like Laura. Earlier this year, Laura spoke about how happy she was coming to Idyllwild Arts. She said that working with Laura was a great experience. The muffin scene didn’t make the final cut, but Jamie said that it was rewarding working with a writer-director who listens to an actor’s point-of-view. Laura got a “green light” on another script that will be produced at Idyllwild Arts in the fall. It wouldn’t be surprising to see the many facets of Laura in that one too. To listen to Laura’s new single, “Time Bomb,” visit iTunes. 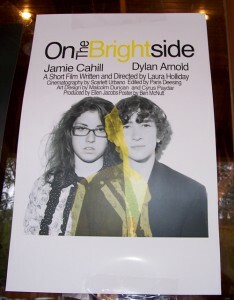 And for more information about the Moving Pictures Department at Idyllwild Arts, visit www.idyllwildarts.org. This entry was posted on Thursday, June 17th, 2010 at 12:22 am and is filed under Idyllwild Arts Academy, Music. You can follow any responses to this entry through the RSS 2.0 feed. Both comments and pings are currently closed.